People can be nominated in different categories, including education, arts, business, military, and public service. The Downey campus has been named to state and national ‘schools to watch’ lists. Services will be held Friday, March 15, at 11 a.m. at Florence Avenue Foursquare Church in Santa Fe Springs. Criseida Serpas and Johana Hernandez will display their new line of clothing. 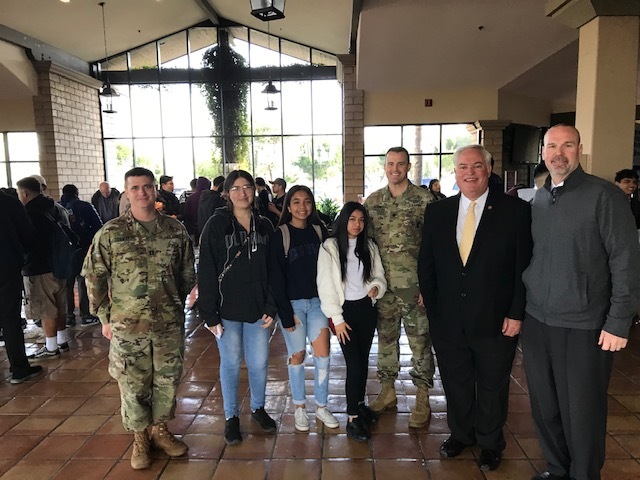 DOWNEY — A few weeks ago, the United States Army and several other branches of our military hosted the Second Annual Downey Career Military Day at Calvary Chapel High School. Downey Unified School District and the city of Downey participated along with several other local schools to let high school students learn about the opportunities available to them in the military. Other branches that participated were the Air Force, Marines, National Guard, Navy, Coast Guard and the Army Reserves. Calvary Chapel School hosted the event which included over 250 students from Calvary, Warren and Downey High. Students had signed up to hear information about potential educational scholarships and career opportunities. Students were provided materials and encouraged to ask questions and to learn about their interests. The Career Military Day collaboration was started last year by a meeting hosted to bring our community together. Trustees Martha Sodetani and Donald LaPlante represented DUSD and Mayor Rick Rodriguez along with Councilmember Alex Saab represented Downey. The event was initiated by former mayor and current Civilian Aide to the Secretary of the Army Mario A. Guerra. General Milley, Army Chief of Staff, is known for saying that “while the military may not be for everyone, the chance to explore the opportunities is something each student should have available to them”. Students heard directly from each branch and also from guest speakers talking about leadership and where they were in their lives based on where they started. Rodriguez gave a talk along with Dr. John Garcia while Guerra was the emcee. Staff Sergeant Ricky Padron and retired Drill Sergeant Rick Rodriguez Jr spoke about their careers in the military and the benefits they receive today from those experiences. Saab alongside DUSD Board Trustees Giggy Saab and Sodetani were also in attendance and participated in talking with our students along with Assistant Superintendent Roger Brossmer. Some interesting facts: most people do not know that the U.S. Army is the largest provider of scholarships in the country and the second largest employer in the world. There are over 150 career choices and 99% of jobs have a civilian application. Almost 7000 soldiers received degrees last year while serving. As CASA, Guerra gives four different multiyear scholarships known as the Minuteman Scholarships and encourages local students to inquire about their availability. There are several benefits to both the individual and to the nation by serving, Guerra said. Soldiers become better citizens and impact the world around them. Soldiers develop the maturity and self-discipline private industries seek. Soldiers are highly trained professionals and hold certifications that qualify them for private-sector jobs. They get leadership training with every promotion with increased responsibility. Veterans are more likely to vote, to volunteer, and be involved in their communities. There are many challenges today for keeping our all-volunteer military. 50% of our youth admit they know little to nothing about military service. 71% of youth do not qualify for military service (obesity, drugs, health problems, misconduct, aptitude) . Only 1% of the population currently serves; and veteran population is declining. 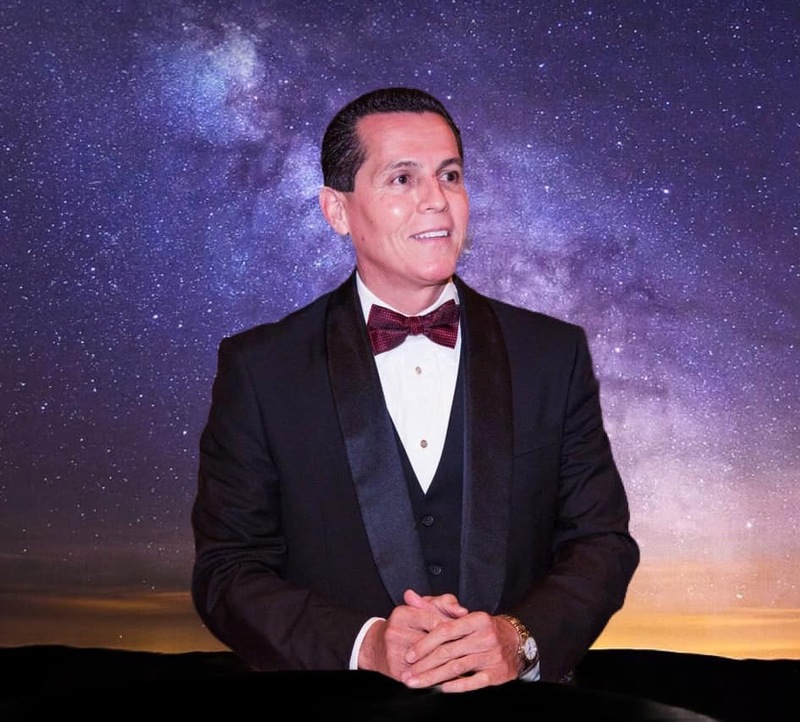 Prominent attorney Felipe Plascencia perished in an airplane crash in the Tehachapi Mountains last week at the age of 53. Join the celebration as the Downey City Library prepares to undergo a massive renovation. Juan Carballo, a junior at Downey High, was selected from a pool of 1,600 applicants. Betty Jean Connor-Latronica-Hixon, passed away peacefully at her home with her husband of 34 years, Jim Hixon, by her side on Tuesday, February 19, 2019 at 3:09 PM. She was 84. Betty was born in Mobile, Alamaba in 1934. Her family moved to New York City and resided there until the untimely passing of her father, a shipyard worker. Her family then relocated to Youngstown, Ohio where her mother remarried. Betty resided there until she met and married Raymond Latronica in 1955. They moved to the Los Angeles, California in 1955 and purchased a home in Norwalk in 1956 where they raised their three children and she resided until her death. Betty worked for Thrifty Drug Stores for 25 years and was grateful for and proud of her union affiliation. She had a fun-loving, dynamic personality. She taught ballroom dancing in the 1950’s and 60’s and enjoyed dancing for many years thereafter. She enjoyed outings at the beach, golfing and organizing golf tournaments. She was a resident of the greater Los Angeles area for 64 years. She was preceded in her death by her first husband, Raymond Latronica, her sister Linda Campbell, her brother, Roy Case, her daughter in-law Terri Latronica, and her son Ollie Latronica. She leaves behind her loving husband Jim Hixon, her sister Marie Bevis, her daughter Allison Minugh, her son Patrick Latronica, 6 grandchildren and 11 great grandchildren. DOWNEY – The Warren High School softball team currently has an overall record of 4-1 and will begin San Gabriel Valley League play when they travel to Lynwood to play the Lady Knights on March 26th. The Bears will travel to Downey on April 4th for the first of their two cross-town rivalry games and will then host Downey on April 22nd to complete this year’s away and home series. The Bears were defeated by La Mirada in the Savanna Showcase at La Mirada 3-2 in 8 innings on February 9th and then defeated Villa Park 6-0 on February 12th. Warren defeated Santa Fe at Santa Fe 3-2 in 8 innings on February 19th and defeated La Serna 4-0 and Culver City 6-4 in a doubleheader on February 22nd. The Bears finished the Savanna Showcase Tournament with a record of 4-1. Warren played Mayfair at Warren yesterday (score unavailable at press time). The Bears are scheduled to play at La Serna next Tuesday and will travel to La Palma Kennedy on March 19th for a doubleheader against the Fighting Irish before they start league play. Warren finished last season with an overall record of 17-13 and were 6-4 in league play. The Bears were defeated by South Hills at South Hills 4-3 in the first round of the C.I.F. Division 2 playoffs. Coach Starksen, her staff and players are all looking forward to softball season. Gahr and cross-town rival Downey will once again be the teams to beat in league play. DOWNEY SOFTBALL: The Downey High School softball team currently has an overall record of 0-2 and will begin San Gabriel Valley League play when they travel to Paramount to play the Lady Pirates on March 26th. Downey was defeated by Lakewood at Lakewood in a doubleheader on February 19th 12-0 in the first game and 4-0 in the second game. The Lady Vikings also hosted South Torrance at Downey yesterday (score unavailable at press time). Downey will be competing in the Best of the West Tournament tomorrow where they will play Murrieta Valley at 9:30 a.m. in their first game and will then play San Marcos at 1:30 p.m. in their second game. The Lady Vikings will then travel to Esperanza next Tuesday to play the Lady Aztecs. Downey is also scheduled to compete in Bullhead City next week with games scheduled on March 7th, 8th and 9th. Coach Garcia, his staff and players are all looking forward to the start of the 2019 softball season. Downey finished last season with an overall record of 24-7 and was the S.G.V.L. co-champion with Gahr, respectively. The Lady Vikings were defeated by San Dimas 2-1 in the second round of the Division 4 playoffs. Gahr and cross-town rival Warren will once again be the teams to beat in league play. DOWNEY BASEBALL: The Downey High School baseball team currently has an overall record of 1-6 and will begin San Gabriel Valley League play when they host Dominguez at Downey on March 11th. The Vikings were defeated by Cantwell-Sacred Heart at Cantwell-Sacred Heart 7-2 on February 11th in their season opener. Downey also competed in the Loara Tournament February 12th-23rd. The Vikings were defeated by Cypress 8-5 in 8 innings on February 12th, were defeated by Villa Park 4-0 on February 18th and were defeated by El Modena at El Modena 2-1 in 10 innings on February 19th. Downey was defeated by Pacifica at Pacifica 1-0 on February 21st and was defeated by San Clemente at San Clemente 4-3 on February 23rd. The Vikings finished the Loara Tournament with a record of 0-5. Downey defeated Narbonne 5-0 on February 25th in their first game of the Downey Tournament and hosted Long Beach Poly yesterday in the same tournament (score unavailable at press time). The Vikings will host Glenn later today. Coach Gonzalez, his staff and players are all looking forward to the 2019 baseball season. Downey finished last season with an overall record of 17-14 and were 8-2 in league play. The Vikings were defeated by Santa Fe at Santa Fe 8-4 in the first round of the C.I.F. Division 3 playoffs. WARREN BASEBALL: The Warren High School baseball team currently has an overall record of 6-1 and will begin San Gabriel Valley League play when they host Paramount at Warren on March 11th. Warren split a doubleheader against Troy at Warren on February 12th. The Bears won the first game 5-3 but were defeated in the second game 8-7. Warren competed in the Newport Elks Tournament February 14th-21st where they finished with a record of 3-0. The Bears defeated Santa Ana Valley 24-0 on February 14th, defeated Estancia 13-2 on February 18th and defeated Santa Ana 7-0 on February 21st. Warren defeated Nogales at Warren 10-0 on February 22nd and defeated El Rancho 8-0 on February 25th in non-tournament play. Warren is currently competing in the Long Beach Poly Classic where they played Bell on Wednesday (score unavailable at press time) and will play South Gate later today. The Bears are also scheduled to play a doubleheader against Hoover of Glendale tomorrow at Hoover. The first game is scheduled for 9:00 a.m. and the second game is scheduled for 12:00 p.m.
Warren finished last season with an overall record of 20-9 and were 7-3 in league play. The Bears were eliminated in the wildcard round of the C.I.F. Division 3 playoffs by Bellflower at Warren 1-0. Coach Pearson, his staff and players are all looking forward to the 2019 baseball season. Everybody sneezes. Some sneezes are barely perceptible, others are loud and distinct, and still others come in multiples. Why do we sneeze? What’s happening when we sneeze? Some liken a sneeze to a reboot of the system; a reset of the nasal environment. Sensory receptors in the nose are activated by mucous, germs, dust, pollen, animal dander, or pollutants. The activated receptors then send signals to the brain stem. The resulting sneeze expels mucous along with the irritants, and this reflex protects us from the particles that might otherwise enter our lungs. It clears our nasal passages so that we can keep on breathing. It happens when we’re sick, allergic, or even anxious. The bottom line is that sneezing is a part of our immune system, and helps to keep our body safe by clearing away bacteria, viruses, and more. Are sneezes controllable? Certainly there is some degree of conscious control; just compare your public sneeze to your private sneeze. At the beginning of the sneeze, when the nose’s sensory receptors first become irritated, it is often possible to stifle it by pinching the nose and shutting the mouth. The next part of the sneeze involves inhaling deeply, and an involuntary blink (perhaps in order to protect our eyes?) and exhaling explosively. At that point, it’s too late to stop, but not too late to shield others. Saliva and whatever accompanies it is shot out at a speed of 30 to 40 mph or more. Due to the force involved, and the very small size of the particles, they can be hurled 5-20 feet away, or even farther. It’s no surprise that a sneeze is an effective way to send germs into a large area, and to spread infectious disease. That is why we are taught to sneeze into a tissue or into an elbow, and why we are reminded to wash our hands with soap and water (or an alcohol-based hand sanitizer) after sneezing and throughout the day. Sneezing styles vary. The strength, sound, and volume of a sneeze depend on the strength of the abdominal muscles, the lung volume, and the size of the windpipe or trachea. The contents of the sneeze might be mostly expelled through the mouth, or might mostly come through the nose. Injuries from sneezing do occur. The most common is muscle strain. Rarely, a violent sneeze has lead to stroke, miscarriage, car accident, broken blood vessels in the eyes, retinal detachment, and fainting. There are rare reports of hearing loss and vertigo as a result of a ruptured eardrum – likely caused by stifling the sneeze. Some people sneeze multiple times. Perhaps those with chronic sinus disease or allergies require more sneezes to completely clear the nasal passages. In a few extreme cases, a teenage boy sneezed three to six times a minute for more than a month, and Guinness World Records lists a 12-year-old girl who sneezed about a million times over a year and finally stopped after more than two years. One unusual sneezing trigger, affecting up to 35% of us, is looking at a bright light. This trigger seems to run in families. Perhaps it’s a result of a crossover of nerve signals, such that the nerve stimulated when the eyes see a bright light also stimulates the nerve responsible for the sneeze reflex. Similarly, plucking eyebrows may trigger that nerve and lead to a sneeze. Working out may lead to sneezing; it certainly does for me. During a long hard run, I breathe large volumes of air (including allergens) and dry out my nasal passages. This leads to the creation of mucous, which leads to sneezes. In some cultures, sneezing is a sign of good luck - which becomes bad luck if two people sneeze at the same time. Other cultures hold that a sneeze means that someone is talking about you behind your back. Saying “God bless you” may stem from the belief that with a sneeze, the soul (which presumably resides in the head) exits the body, and that by saying this, you are protecting the person who sneezes. Your next sneeze is inevitable, so God bless you all! Mayor Rick Rodriguez, second from left, and U.S. Army Civilian Aide to the Army Mario Guerra, second from right, at a Military Career Day event last week. DOWNEY – Military veterans and active duty personnel will be honored at a “Salute to the Armed Forces” breakfast Saturday, April 6, at First Baptist Church of Downey. Guest speakers include state Sen. Bob Archuleta; Mario Guerra, civilian aide to the secretary of the Army; and Paul Reinhard, a former Green Beret. There will also be a showcase of military vehicles. Admission to the event is $5. RSVP by calling (562) 923-1261, ext. 226 or email shirleyf@fbcdowney.org. RSVPs for the fundraiser lunch are due by March 5. Barney Santos is opening BLVD MRKT in Montebello, a food hall and business incubator. A man handed this note to a Warren High student last week. The phone number has been digitally redacted. The student was approached at the Circle K on Paramount Boulevard.